Resonite secured 1st position in State Science Seminar. Will represent Rajasthan on All India Level. 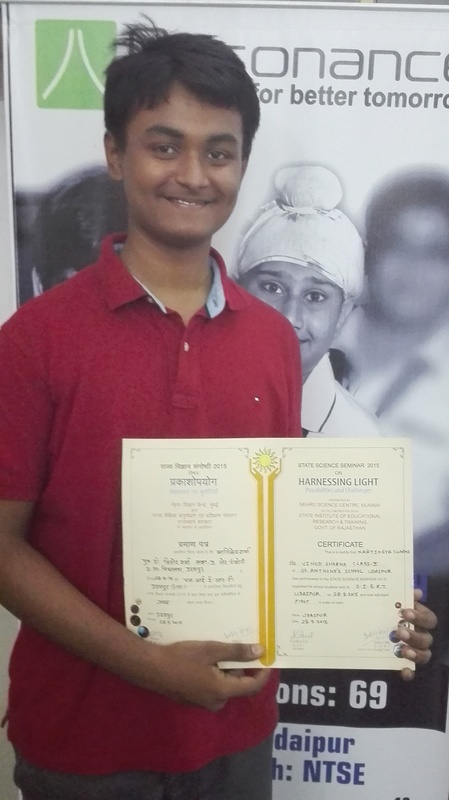 Resonance PCCP Udaipur has once again added one more star to its glory as one of our students Master Kartikey Sharma (Class X ) has secured first position in the State Science Seminar 2015 organized for school students held at State Institute for Educational and Research Training, S.I.E.R.T, Udaipur. State Science Seminar 2015 on “Harnessing light: possibilities and challenges “was organized by Nehru Science Center Mumbai in collaboration with S.I.E.R.T., Govt. of Rajasthan. Every year thousands of students participate in the seminar. Last year almost 20,000 students participated across India. Out of thousands of student 35 students are selected from all over the country including 29 state and 7 union territories. One student from each state or territory is selected to represent it’s state at national level seminar organized by National Council of Science Museums (Ministry of Culture, Govt. of India). This year it is going to be held at Pragati maidan , Delhi. This seminar is conducted at two levels in each state Firstly at district level, then at state level the one who secures the first position represents his state at National level. Kartikey has been conferred with the golden opportunities to represent Rajasthan. It is a pride moment for all of us to see our student achieving new heights. In national seminar top 9 students will be selected at all India level where the first position holder will receive the scholarship worth Rs. 2000 per month for one year and remaining 8 students will get scholarship worth Rs. 1000 per month for one year. Top 3 students among these 9 students will be selected to represent India in Further international seminars. Resonance PCCP Udaipur has already been conferred with this achievement as in session 2011-12 one of our students Master Divyansh Ameta Reso Roll no-9000513 (IIT DELHI NOW) was selected among top 3 to represent India in an international seminar . He was given an opportunity to visit Marie Curie’s Lab in Paris Sponsored by Govt. of India.